Led by a 2.7% plunge on SHCOMP, Asian markets were lower following announcement that National Bureau of Statistics showed a 5.2% slump in profits for China’s state enterprise combined earnings during the first two months of the year. Sentiment was cautious as risk-shy investors await fresh leads on growth prospects for the U.S. durable goods orders after a sluggish March’s consumer confidence index on Tuesday. 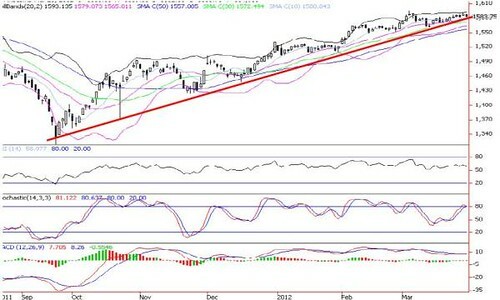 The KLCI is holding well above the uptrend line support or 30-d SMA (1572) during recent market consolidations. 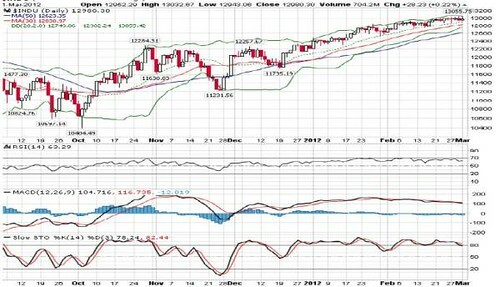 Looking at the chart, we believe prices could still make one more push towards historical high at 1597, but sustainability is suspect. 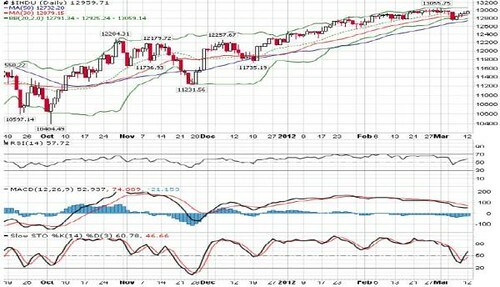 The key risk is that, if the candles fail to hold above the 1572 level, then most probably it will fall back towards 1549 (16 February pivot low). Strategy wise, investors should capitalize further rallies to take profits and stay nimble, in the wake of volatile external markets as well as ahead of the looming 13th general election. gained 7.7% to 1,068,774 tonnes. 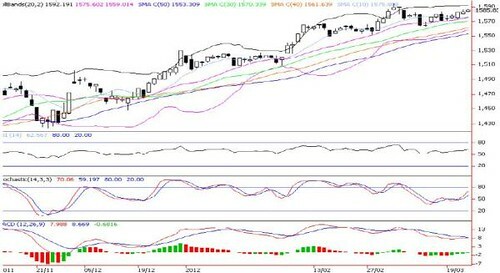 The uptrend is also in line with the overall bullish CPO forecasts by the industrial experts (ranging from RM3000-4500) during the Palm Oil Conference in March. Current prices are also trading at 5.7% above 2011’s average of RM3274 and 8.1% of YTD average of RM3200. 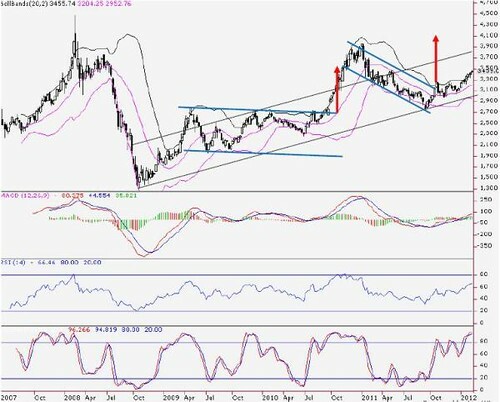 In view of the bullish technical readings, there could be further upside to retest RM3500-3600 zones before profit taking consolidations emerge. 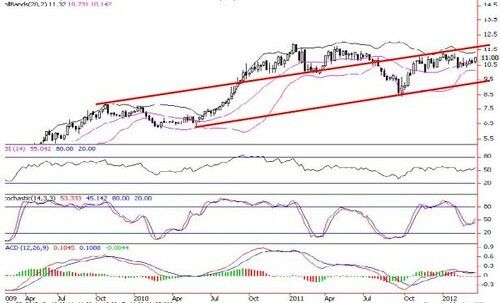 Medium to long term significant resistance targets are RM3900-4000. 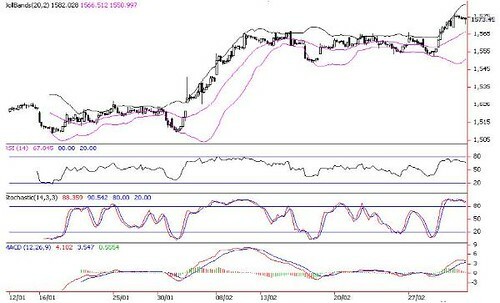 Short term supports are RM3334 (mid Bollinger band), RM3304 (30-d SMA) and RM3241 (50-d SMA). 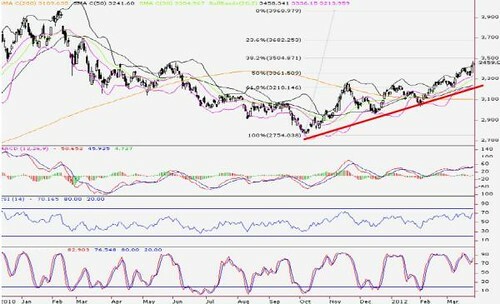 Uptrend will be disrupted if prices break below RM3241. The Dow Jones dropped as much as 43 points intraday amid weaker global manufacturing PMIs from China, France and Germany couple with declining U.S. Jan new homes sales. However, the Dow Jones ended the day with a +34 points gain as a 1.4% surge in oil prices spurred energy shares, following report that Iranian crude exports could reduce by 30k barrels/day as buyers have stopped or scaled back purchases amid tightening sanctions by the West over a dispute over Tehran’s nuclear program. 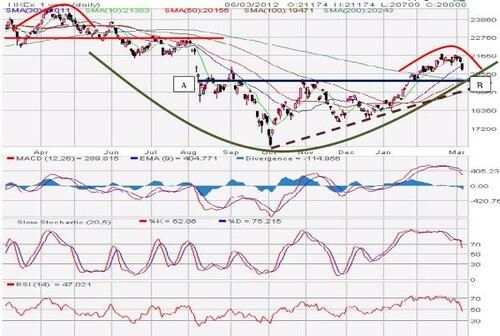 Last Friday, Asian markets were rattled by slowing factory activities in China, Germany and France that could spark fresh concerns over global economic growth. Bucking regional peers, the KLCI was up 2.6 points to 1585.8 and recorded a weekly gain of 0.9% (after two straight weekly losses), as local funds returned to prop up selected index heavyweights. However, trading volume plunged 30% and gainers/losers ratio was bearish at 0.5x after the authorities prevented proprietary and day-trading by certain brokers in selected highly speculative stocks. Due to improving daily and monthly technical readings ahead of the 1Q window dressing activities, there could be one more upleg to retest 1597 (historical high) if YTD high of 1595 (5 Mar) is violated this week. 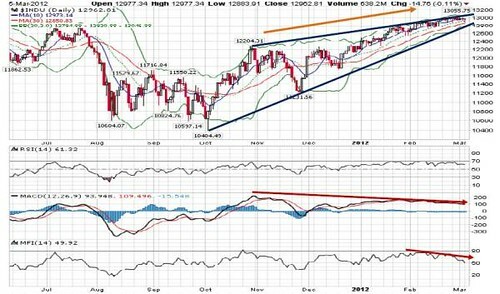 Otherwise, the market is expected to stay ranged bound. 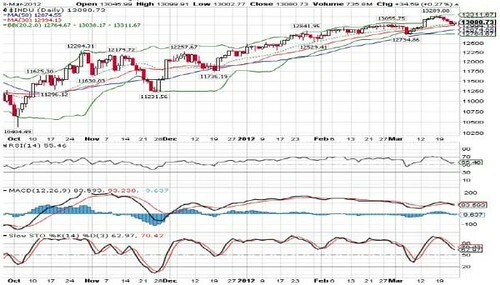 Key supports are mid Bollinger band (1575), uptrend line (UTL) or 30-d SMA (1570) and 40-d SMA (1561). In the wake of the renewed concern of global economic health, the EU leaders meeting at Copenhagen this weekend as well as the 13th general election, we advice investors to capitalize further rallies to trim their shareholdings and stay nimble amid volatile external markets. # Local daily reported that U Mobile has submitted a request to terminate its domestic roaming (DR) agreement with Celcom Axiata last week. # The article also expects that U Mobile to ink a new DR agreement with another operator over the next 6 months. 2. Usage based (mins/MB) – RM4-7.5m per month. # This news did not surprise us at all as we have flagged this concern in our report titled “Celcom Breaking Up with U Mobile” dated on 24th Oct 2011. # This event is very much anticipated as it is technically more feasible (less network signaling load and unnecessary handover) and operationally more economical (lower fixed monthly connection rental) to engage with one DR partner rather than two who have overlapped coverage. of Malaysia and service fallback to 2G should be inclusive. # U Mobile’s 10-year partnership with Maxis which also include future LTE rollout has created conflict of interest in its current relationship with Celcom who has teamed up with DiGi. # We do not expect Celcom to terminate this agreement earlier as payment from U Mobile contributes directly to its bottom line with negligible OPEX. Regulatory risks, FOREX fluctuations and competitive risks. Unchanged as we have already factored this into our model. Despite the challenging 4Q11, Axiata’s main businesses (Celcom, XL, Dialog) continue to execute well. # According to Business Times Singapore, Casino Regulatory Authority (CRA) has awarded junket licenses to two Malaysians operators (Huang Yu Kiung and Low Chong Aun) to allow casino operators to extend their international reach. This is given after a series of stringent checks on their background and financial positions. # CRA said that the regime to regulate the junket operators has “been enhanced to ensure its gaming environment continues to be tightly regulated and free from criminal influence”. # Apart from these two operators, the CRA is still evaluating other applications and is in the midst of conducting probity checks. It has rejected twelve applications so far. # This newsflow is positive to GenT indirectly as Genting Singapore (GenS) now has the right to carry out junket programmes in RWS. These licenses are valid for a year. # With this official permits, these two Malaysian operators will now be allowed to bring in high rollers to the casinos in RWS for a commission. However, they are only allowed to bring in foreigners and not allowed to target the local community. # We expect GenS to be able to experience better earnings growth going forward with the help of the recently-approved junket licenses as it will bring in more customers into the casino, especially from the VIP segment. # As for RWS’s competitor, Marina Bay Sands (MBS), it still does not have access to licensed junkets. Hence, we are positive that RWS will be able to overtake MBS in its market share once the junket programme is implemented. 5) Higher-than-expected cannibalisation from Marina Bay Sands (MBS) and Macau casinos; 6) RWS’s junket license not renewed after a year. (2) New sources of earnings from international markets to drive earnings growth. (2) Leisure and hospitality’s earnings highly dependable on luck factor and hold percentage. Target price remain unchanged at RM11.50 based on SOP valuation. Maintain BUY. Despite the alarming China’s trade deficit news, Dow held up well with a 38 points gain ahead of the FOMC announcement tonight as well as the eurozone finance ministers meeting in Brussels today (which is likely to approve the terms of Greece's second bailout). Trading volume was thin as investors await some key economic releases i.e. February retail sales (tonight), Feb IPI/March consumer sentiment (16 March). Overall, the Dow Jones’ near term outlook remains stable, driven by expectations of improving economic data, the Fed’s reinforcement of exceptionally low long-term interest rates until 2014 and the possibility of additional stimulus via sterilized bond-buying program. The sterilized bond-buying program is designed to drive down long term interest rates to boost economic activity by buying mortgage-backed securities and Treasuries. Asian shares ended lower on Monday after China recorded its biggest trade deficit in 12 years as exports grew at a slower rate than expected in February, overshadowing a rebound in Japan’s machinery orders and a resilient U.S. jobs data. Tracking the weak regional performances, sluggish Jan IPI report (+0.2% yoy and -3.1% mom) and fears of a possible dissolution of Parliament (when it resumed yesterday) that would pave the way for a general election in May/June triggered the sharp profit taking correction to KLCI. 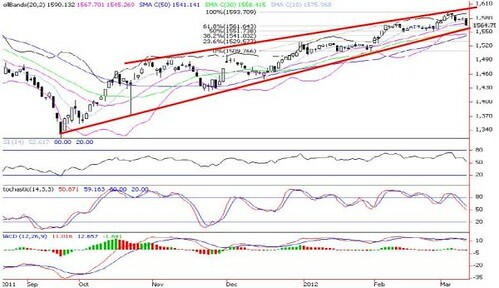 Following the KLCI’s sharp drop yesterday and its failure to hold above the mid Bollinger band support, we are changing our positive view on the market to cautious now as the 1.9% retracement from 5 March’s pivot high of 1594.7 (shy of its historical peak of 1,597) could be a trend reversal arising from a double-top formation. 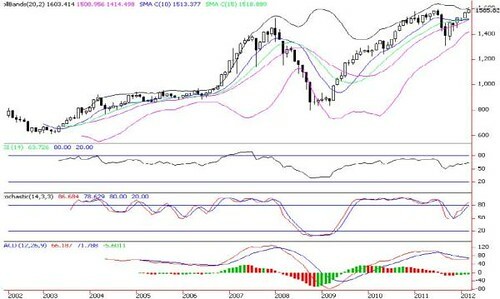 Moving forward, the bears look stronger now as the KLCI is poised to retest lower key supports i.e. 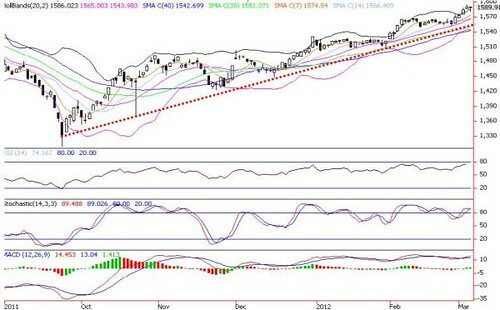 the uptrend line (UTL) or 30-d SMA near 1558 and 16 February’s low of 1549 amid weakening technical readings. 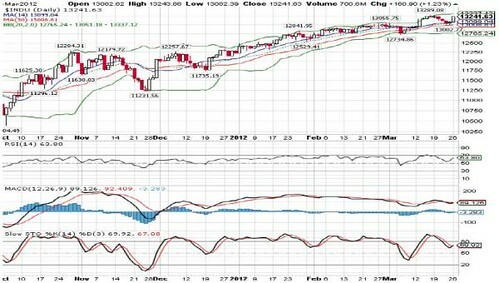 Further supports are lower Bollinger band (1545) and 50-d SMA (1541). If these levels are breached, it would eliminate all bullish potential. global PMI in Europe and China (despite improving m-o-m). 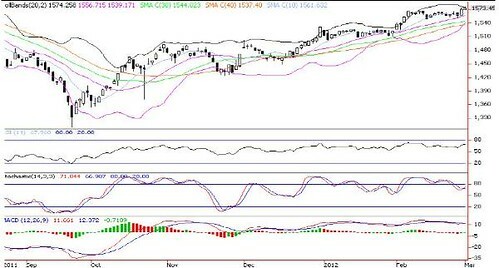 KLCI gained 3.8 points to 1573.5, lifted by selective purchase on bluechips i.e. SIME (+24 sen to RM9.93), PETCHEM (+5 sen to RM6.75), BAT (+90 sen to RM53.10), DIGI (+2 sen to RM4.04) and AMMB (+4 sen to RM6.17). However, overall volume was low at 1.62 biilion shares worth RM2.02 billion against Wednesday’s 1.94 billion shares worth RM2.69 billion. Market breadth was negative with 309 gainers as compared to 506 losers. Amid the fresh injection of cheap money by the ECB, additional liquidity inflows are expected to stay firm in the near term, benefitting equities and currencies in the emerging markets. 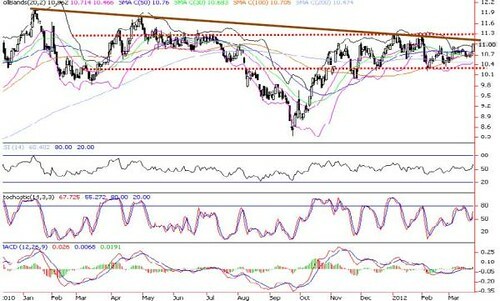 We are cautiously optimistic that the recent breakout of 1567 (16 February’s high) will eventually spur KLCI to our new envisaged resistance 1590-1600 levels, albeit intermittent profit taking activities. 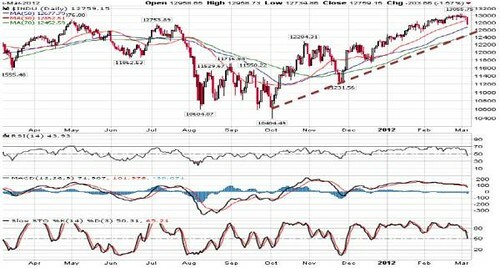 However, higher volume (preferably over 2 billion shares/day) is essential for a sustainable rally. 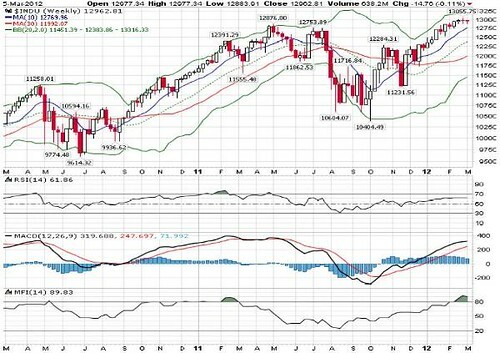 Major supports are 1561 (10-d SMA), 1556 (mid Bollinger band) and 1544 (30-d SMA).